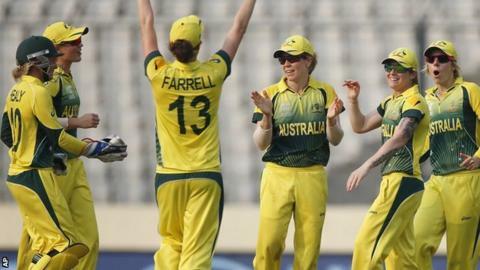 Holders Australia booked their place in their third successive Women's World Twenty20 final with an eight-run victory over West Indies in Mirpur. Opener Elyse Villani top scored with 35 as the Southern Stars made a competitive 140-5 from their 20 overs. The Windies briefly threatened when Deandra Dottin (40) and Stacy-Ann King (36 not out) were together, but fell short after Dottin holed out. "What West Indies did show was the ability to manoeuvre the ball, but it was a good performance from Australia and they should be happy." England, winners in 2009, meet South Africa in the second semi on Friday. West Indies openers Stafanie Taylor (24) and Kycia Knight (21) added 43 in seven overs thanks to some early boundaries before both fell in quick succession. Taylor was run out attempting a second run on a misfield, while Knight was bowled trying to slog off-spinner Erin Osborne. The stage was set for the big-hitting Dottin and King as West Indies side looked to knock out the side who thrashed them in last year's 50-over World Cup final. Both batters hit sixes against the Australian spinners, but just when it looked like West Indies were favourites, Dottin skied a low Sarah Coyte full toss high over deep mid-wicket and Osborne - named as player of the match for her economical spell of 1-18 - held her nerve to take the catch. It left the Windies still needing 20 from the last 10 balls, which proved beyond them as seamer Rene Farrell bowled a tight final over. Earlier, Australia had tinkered with their batting line-up, promoting left-arm spinner Jess Jonassen to open for the first time in her international career and moving keeper Alyssa Healy down to number seven from opener, but Healy's 30 from 21 balls at the end of the innings. Skipper Meg Lanning, who explained that the switch had been made so that a left-hander could open with Villani, said: "We knew the West Indies were very dangerous and they showed what a great side they are, so it's great to get over the line. "We know we're going to have to play well [in the final] but it's something we have to make the most of because they don't come around too often." West Indies captain Merissa Aguilleira added: "It's very disappointing but it's all about how well we learn from it. It has been a great tournament."